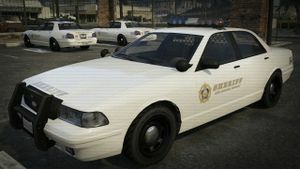 The Sheriff Cruiser is a law enforcement vehicle in Grand Theft Auto V.
The Sheriff Cruiser is a variant of the Vapid Stanier fleet sedan. Presumably, the Sheriff Cruiser's suspension is more robust than its LSPD counterpart due to the rough terrain of rural Blaine County. It otherwise performs identically to the LSPD version. Police Cruiser: marked LSPD variant. Unmarked Cruiser: unmarked LSPD variant. This page was last modified on 25 April 2015, at 20:39.